BANGALORE, India ? India?s Chandrayaan-1lunar orbiter mission, which launched last October, ended 14 months prematurelySaturday after an abrupt malfunction, the Indian Space Research Organisation (ISRO) said in a statement. ISRO saidscientists abruptly lost radio contact with the nation's firstplanetary probe, which was designed to operate for two years in orbitaround the Moon. ISRO spokesman S. Satish told Space News, SPACE.com?ssister publication, on Saturday that attempts to reestablish contact hadfailed and that the mission was as good as lost. Thespacecraft, carrying a payload of 11 scientific instruments ? sixsupplied by U.S. and European partners ? was orbiting at an altitudeof 124 miles (200 km) and could crash any time on the lunar surface,he said. 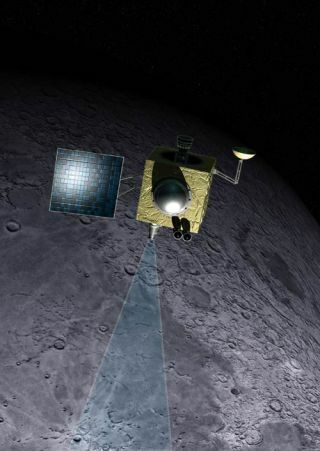 The end comes four months after the onboard star sensor fordetermining Chandrayaan-1's orientation beganmalfunctioning April 26, forcing controllers to activate a backup system tokeep the spacecraft's antenna pointed to the ground station near Bangalore. The ISROrelease said the spacecraft had made more than 3,400 orbits around the Moon,sent nearly70,000 images, and that most of the scientific objectives of the missionhad been met. ISRO is collaborating with Russia on a follow-on Moon mission,which will include a lander and rover and is slated for launch in 2012.